In Puerto Vallarta there’s a fantastic company that specializes in open-ocean dolphin encounters via a boat-based dolphin watching tour. 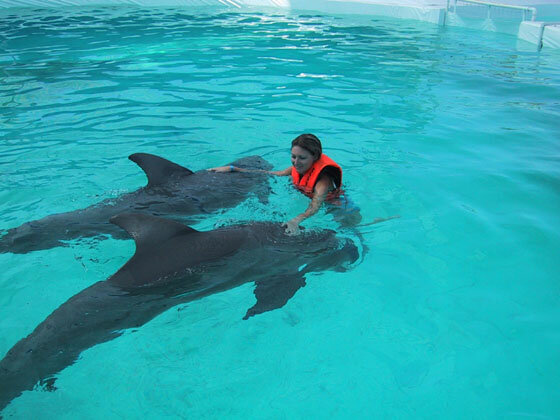 Within Nuevo Vallarta there are three professional facilities that offer swim-with-the-dolphins programs. Each program offers an excellent opportunity to learn about these amazing and intelligent marine mammals while interacting with them in their captive water environment. Most dolphin encounter programs are generally structured for small groups. For viewing and interacting with dolphins in their natural habitat, this company employs listening equipment to locate wild dolphins out in the ocean. Once dolphin pods are found, boat passengers are encouraged to enter the water to interact with these dolphins in their natural ocean environment. Wildlife Connection guides are professional biologists who enjoy sharing their knowledge about marine-life and providing interesting insights about the bottlenose dolphins living in the waters of Banderas Bay. This unique opportunity to swim with wild dolphins out in the open ocean is a very special once-in-a-lifetime experience not to be missed. 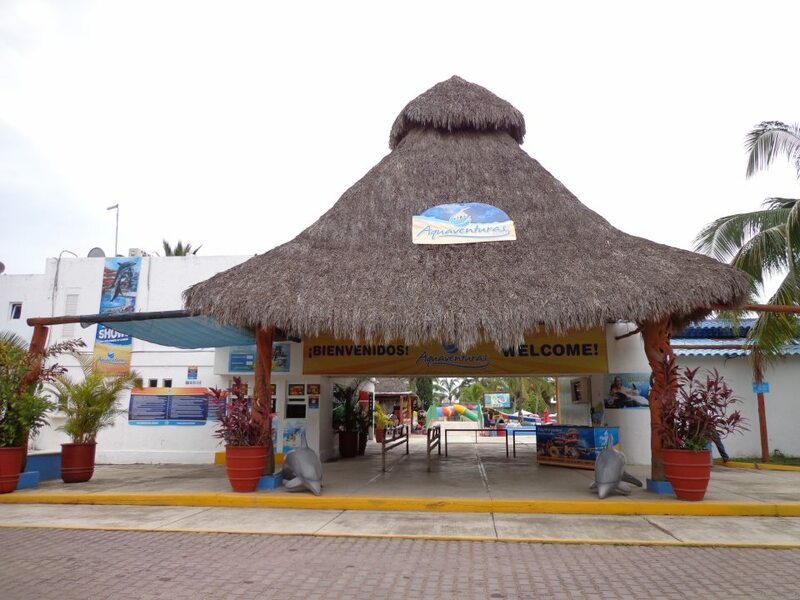 The Vallarta Adventures Dolphin Center overlooks the beautiful Nuevo Vallarta Marina. This facility services not only tourists in Nuevo Vallarta, but vacationers who are staying in Puerto Vallarta as well as those arriving on cruise ships. Within Vallarta this is the premier place to swim with Pacific Bottlenose dolphins and to swim with sea lions. Several different interactive programs are offered to include the dolphin signature swim, an extreme swim, private swims for couples, private swims for families, a kids program, trainer for a day, and a program for special-needs guests. You’ll create memories that will last a lifetime. For the best rates book online four days or more in advance of your first Vallarta Adventures tour. This beautiful water slide park and interactive aquarium offers swim-with-the-dolphin programs as well as sea lion encounters. Aquaventuras Water Park is located in Nuevo Vallarta just 10 minutes from the PVR airport at the first entrance (southern entrance) to Nuevo Vallarta. It’s on the right-hand side when exiting the freeway, just behind the tall, white Eurowindows building. This really fun water park offers daily dolphin and sea lion shows, and 10 exciting water slides. There is a Water World children’s area with a pirate ship, low-speed mini water tobagans and a kiddie paddling pool. This facility is further enhanced by a lazy river, swimming pool, lounge areas, and a snack bar. Aquaventuras Water Park is open Monday through Friday from 10 a.m. until 5 p.m. At the entrance to Aquaventuras visitors can purchase discounted combo packages that include the water slide park entrance free plus specific food items and beverages. Separate from the water park’s operational hours, Aquaventuras has a swim-with-the-dolphins program. The Dolphinarium is open every day. As of 2014, the participation fee is $25 USD for adults and $19 per child (ages 4-11). Rates for the dolphin (or sea lion) swim adventures program: $109 USD for adults and $79 USD for children (ages 8-11). The daily dolphin swim schedule is: 10 a.m., 11:15 a.m., 1:45 p.m., and 3 p.m. The dolphin swim fees include water slide park admission. But keep in mind that the water slide portion of the facility is closed on weekends, so be sure to plan accordingly. The prices for professional swim-with-the-dolphins photos start at $16 USD, with the prices for videos starting at $39 USD. Days/Times for Dolphin Swims: Monday through Sunday, at 10 a.m. and 12 p.m.
Splash Water Park Dolphin Swim Program in Nuevo Vallarta, Mexico. Swimming with the dolphins is the highlight of the day when visiting Splash Water Park in Nuevo Vallarta, Mexico. This unique experience gives participants the opportunity to interact with sweet and friendly bottlenose dolphins. The 45-minute program begins with a brief orientation given by a dolphin trainer. The informative talk provides information about these intelligent, talented, and amazing mammals. Groups of six participants then jump into the pool and begin their exciting 30-minute dolphin experience. Under the instructor’s supervision, the dolphins swim freely for the first 12 minutes while they become acquainted with their new friends. Once dolphins have had an opportunity to have a close encounter with participants, everyone can fully interact with the dolphins for 18 minutes. You can pet them, dance with them, sing with them, hug them, and enjoy a dorsal tow around the pool. Reservations to swim with the dolphins must be made at least 7 days in advance. Reservation changes and cancellations must be made at least two days prior to the day of the activity. Reservation changes and cancellations one day prior to the activity are subject to a 50% charge. No refunds or cancellations can be made within 24 hours of your visit.